Born in England on April 14, 1860, Spokane architect Arthur Edward Saunders reportedly apprenticed in the building trades before immigrating to the United States in 1885. He had also taken a course in the “science of construction” at the art school in South Kensington. At the age of 25, seeking new adventures, Saunders moved to California and formed an architectural practice with Daniel A. Damkroeger in Santa Cruz. Together they design a high school in Soquel (1889), a suburb of Santa Cruz; and the Visalia Railroad Company Depot (1893) and High School (1896) in Visalia. While the partnership lasted for a few short year, Saunders remained in California for tweleve years. While there he me a married California native Carrie Gould in 1896. 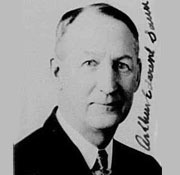 Together they had one son, Arthur G.
While some publications note that he designed about 30 homes in Spokane, the exact locations of these dwellings are unknown at this time. Known projects include the Florence Crittenton Home for Unwed Mothers (1903); a rental house for C.J. Fauling (1901, w 5th Ave. & s Oak St.); the A.A. Barnett House (1904), 902 w Augusta); the Wilson Apartments (S. 309 Wall, Spokane); and the Lincoln Hotel (1902), the Harrington State Bank (1901), and a store for A.C. Billings all in Harrington. At least one of his designs was featured in Keith Magazine on home Building (Jan 1910). Saunders and the family left Spokane and moved to Boulder, Colorado in 1904. Shortly thereafter he formed a partnership with Charles H. Wright. However by 1907 they had parted ways and Saunders continued with an independent practice. Over the next 20+ years Saunders made a significant impact on the community of Boulder designing a variety of buildings in multiple architectural styles. Notable projects include the Grill Mansion (1905); the Christian Church (c.1915); and the Randall-Hickman House (1918). After his first wife, Carrie, passed away, Saunders remarried in 1917 at the age of 56. His second wife, Alda Ann Barnes (27 years his junior) was also a widower and had a young 10-year old daughter, Katie Mae. Polk Directories indicated that Saunders continued to practice until death on October 29, 1930. He is buried at the Green Mountain Cemetery in Boulder. His son, Arthur Gould Saunders, was longtime draftsman in a variety of architectural firms but never became a licensed architect. Spokane: The Queen of the Inland Empire. "Western Progress." September, 1902, page 25. "A. E. Saunders ..." The Harrington Citizen, August, 2 1901. "A House for an Unusual Lot" - Keith's Magazine: January 1911. “A.E. Saunders, the Spokane architect was…” The Harrington Citizen, Aug 2, 1901. “Building Boom is On." Spokesman-Review June 2, 1901. “Boulder, Colo – The Board of County Commissioners…” The Western Contractor – July 14, 1914. Edwards, Rev Johnathan An Illustrated History of Spokane County, State of Washington, W.H. Lever Publisher, 1900. Chase, John & Daniel P. Gregory, The Sidewalk Companion to Santa Cruz Architecture. The Museum of Art & History, Santa Cruz, CA, 2005.